This Kids Science Newsletter includes a question of the month, current science events, and a simple science experiment. How did the idea that groundhogs could predict weather come about? An asteroid passed only 202,000 miles by Earth. The asteroid has been named 2005 YU55. Asteroids traveling around the Sun pass by the Earth on their travels often. The asteroid was closer to the Earth than the Moon. It is the first time in three decades that an asteroid this large has passed so close to the Earth. It is passing Earth and can be seen at night on November 8, 2011. Python Hearts Change Size When They Eat! Pythons eat by swallowing hole the bodies of animals. The strange thing is their heart grows larger as they are digesting their food. Olympic-caliber athletes also have enlarged hearts and scientists wanted to know how this occurred because the hearts of pythons and athletes are both healthy. They have found specific changes in the pythons that may in the future help people with heart disease. A powerful nor'easter swept along the East Coast in late October. Pennsylvania was the hardest hit and some areas received over a foot of snow. The snow was more like the storms that sweep along the coast in February. Diehard football fans drove through the snows to watch their favorite teams in actions. Deer running across the road in front of cars cause 1 million accidents each year. Approximately 200 people are killed in the accidents and 10,000 people are injured. West Virginia has the highest number of deer related accidents. A University of Alberta studied areas where there were a lot of deer related accidents within the city limits of Edmonton. They put up warning signs in half of these areas. They found that the warning signs worked! The collisions dropped from 139 accidents in the city dropped to 78. Zedonks are crosses between a female donkey and a male zebra. Some salamanders have the ability to regrow their tails, legs, parts of their spinal cord, organs and eyes. The Amazon River pushes so much water into the Atlantic Ocean that people can dip fresh water out of the ocean over a hundred miles from its mouth. The Dead Sea is so salty that it is impossible for a person to sink. Your body contains enough iron to make a two-inch nail. There is more water in the Pacific Ocean than all the other seas and oceans combined. Your fist is about the same size as your heart. Try licking you elbow to see if you are part of the 1% that can do it. Ninety-nine percent of people cannot lick their elbow. Clastic sedimentary sandwiches form when layers of debris form layers and are compacted. 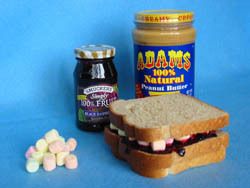 In this activity you will be creating sedimentary rocks using bread, peanut butter, jelly and marshmallows. Place a slice of wheat bread on the plate. Spread peanut butter on the slice of bread. Place a slice of white bread on the plate. Spread jelly on top and sprinkle marshmallows on top. Repeat the above steps until all the bread is used. Now its time to enjoy your Sedimentary Sandwich with a glass of milk! Sedimentary layers form in lake bottoms and ocean floors after floods. Rivers carry sediment from the land into bodies of water where they settle out. Each layer is separated by a bedding plane that is a slightly different color. When the layers are deep enough water is driven out of the layers and they harden into sedimentary rock. German farmers started the idea by watching badgers. The sleepy badgers would come out of winter hibernation and see their shadow on a sunny day. They would quickly duck back in their hole for another for another six weeks. If it was a cloudy day they would stay out knowing spring had arrived. German farmers coming to America brought the celebration to the United States. The farmers used groundhogs instead of badgers because they couldn't find any badgers in Pennsylvania.